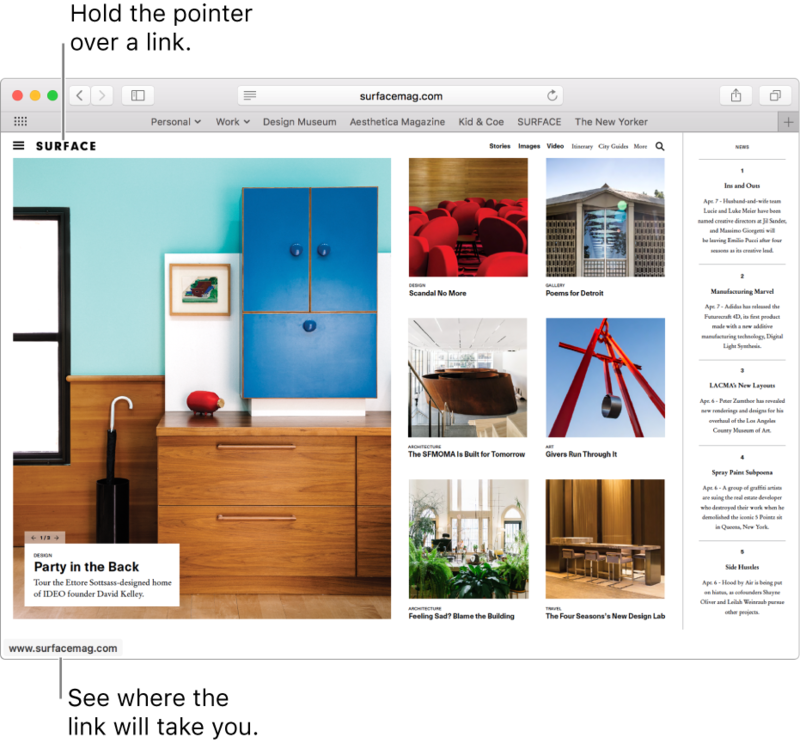 You can change the layout of Safari bars, buttons, and bookmarks to suit your browsing style. In the Safari app on your Mac, choose View > Show Favourites Bar. In the Safari app on your Mac, choose View > Show Status Bar. When you hold the pointer over a link, the status bar at the bottom of the Safari window shows the link’s full address. Change the items in the toolbar: Choose View > Customise Toolbar, then add, remove, and rearrange toolbar items by dragging them. For example, you can add an iCloud Tabs button that shows a list of webpages open on your other devices that have Safari turned on in iCloud preferences. Quickly rearrange toolbar buttons: Press and hold the Command key, then drag buttons right or left. This shortcut doesn’t work for the Back/Forward, Sidebar, Top Sites, Home, History, or Downloads buttons, or the Smart Search field. Remove a toolbar item: Press and hold the Command key, then drag the item out of the toolbar. Show or hide the toolbar in full-screen view: While in full-screen view, choose View > Always Show Toolbar in Full Screen. To customise Safari even more, choose Safari > Preferences, then change options.